A wave of arrests intended to forestall one of Kazakhstan's most vociferous protest efforts in years appeared to help authorities blunt an outpouring of anger over planned land reforms over the weekend. But the latest parry against public opinion also risks elevating the profiles of dissenters in the tightly controlled country, the wealthiest and most diverse of Central Asia's five post-Soviet republics. And where better to look for regime critics than the jail cells that for decades have held all form of opponents of President Nursultan Nazarbaev, who has ruled Kazakhstan with an iron grip since the dying days of the U.S.S.R.? 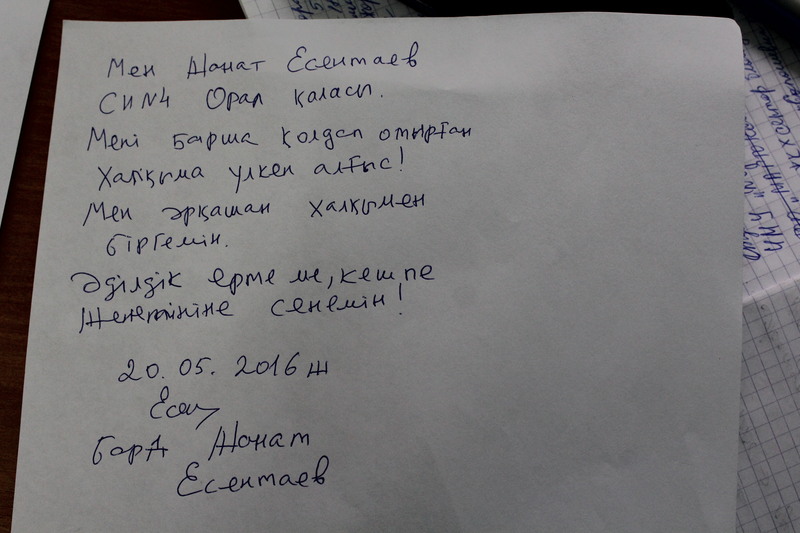 From one of those detention centers, a plea for justice emerged via a handwritten note reprinted in the Uralskaya Nedelya newspaper in the city of Oral, where a rabble-rousing poet and songwriter was among the hundreds of people rounded up across the country before and around the unsanctioned May 21 demonstrations. A prominent Kazakh singer and poet known for his trenchant criticism of the authorities and his dedication to a variety of causes, Zhanat Esentaev could face up to seven years in jail if he is charged. Esentaev's and other detentions between May 17 and the planned protest day appeared to signal a departure from the brief official walk-back that took many people by surprise despite angry demonstrations, social media posts, and other public reaction. Economy Minister Erbolat Dosaev announced in late March that the government would begin in July to auction off poor or unused land to make it productive again under the stewardship of private owners, stemming from amendments to the Land Code adopted in November 2015. It was thought to apply to around 1.7 million hectares of fallow agricultural land. In a nearly unprecedented move on May 5, public outrage prompted Nazarbaev's office to announce it was postponing the reforms until 2017, including the hot-button issue of long-term leases to foreigners. There are fears -- exacerbated by nationalism -- that the process is rigged against small farmers and that parcels will overwhelmingly end up in the hands of the wealthy or leased to foreigners, including the Chinese. Esentaev was among the applicants for a permit for a May 21 demonstration in Oral against the land reforms. He also confronted a ruling lawmaker, Shavqat Otemisov, at one of the many town-hall-style meetings that authorities have organized to try and convince Kazakhs to embrace the planned changes. "Do not allow foreigners to lease our land," Esentaev told the gathering on May 5. "Will you be able to move Chinese from our land after they lease it for 25 years? Who will be here in 25 years? You will not be here in 25 years. Nazarbaev will not be here in 25 years. As our fairy-tale character used to say, in 25 years either the king is gone or the donkey is dead!" Most of the detainees hauled into custody in the capital, Astana, Almaty, and other cities ahead of the May 21 plans to demonstrate were released with jail sentences of up to 15 days. But nearly a week after police searched Esentaev's apartment in northwestern Kazakhstan and confiscated his computer, lawyer Larisa Simonenko said, he remains in custody under two-month pretrial detention with investigators accusing him of "inciting social hatred." He appears to be the only detainee facing possible criminal charges. The charge of inciting social, religious, ethnic, or racial hatred carries a possible sentence of up to seven years in jail. On the day of the planned antireform protests, May 21, websites were blocked and more than 1,000 activists and would-be demonstrators were apprehended by police across the country. Esentaev's Facebook page urges "No To Land Sales!" and includes several defiant texts. I will allow nobody to sell my land." Hearts of Kazakhs, truly owners of my land." Among other features, the slated reforms would allow agricultural land to be leased to foreigners for up to 25 years. A 2006 census indicated that slightly less than one-third of Kazakhstan's "76.5 million hectares of agricultural land is permanent pasture, and 32 percent is classified as arable land" for row crops, according to the U.S. Department of Agriculture's Commodity Intelligence Report. The same source says its total sown area -- including for grains, grasses and other forage crops, technical crops, and food crops -- "decreased sharply" in the late 1990s, continuing a downward trend that reportedly began two decades earlier. Esentaev's hoarse voice, accompanied only on guitar, and his free style with the language of common Kazakhs is reminiscent of prominent Soviet-era Russian performer Vladimir Vysotsky. And just as Vysotsky's lyrics explored the individual in ways that were generally taboo under Soviet censors, Esentaev's songs frequently appear aimed at irritating Kazakh authorities. Giving a green light to the thieves." Esentaev's cris de coeur that have gone viral in Kazakhstan include songs about official corruption, economic hardship, a deadly crackdown on striking oil workers in the southwestern town in Zhanaozen in 2011 ("You shot your own people"), the imprisonment of opposition activists, and clampdowns on civil institutions and independent media. Human Rights Watch accuses Kazakh authorities of "heavily restrict[ing] freedom of assembly, speech, and religion, and torture," and of jailing or otherwise punishing peaceful and unsanctioned protesters, as well as of conducting "unfair trials" of government critics.